Happy Monday! I hope you’re not getting bored with all of my photos from overseas. I still have about a week left of content! While in London, I had the opportunity to stop in Reiss headquarters to meet with the team and find out what’s coming up next for the brand. In addition to a chat with the PR girls, I got to pick out a few pieces to take home with me! The pieces I chose were this laser cut midi skirt and this pretty blouse – I plan to style them together closer to Christmas to showcase a holiday party look (stay tuned! ), but per usual, I couldn’t wait to wear them. I thought the skirt would be the perfect piece for my day in Paris, paired back with the & Other Stories blouse I had picked up a few days before and my Iris & Ink coat. You all know how I love a good midi skirt, but the laser cut detail really grabbed my attention – it’s a modern look with a sophisticated silhouette. The ideal skirt for work, don’t you think? A few other Reiss pieces you must discover include this dainty mint cape, this red lace dress (holiday party essential!) and this tailored belted coat. I also love this oversized sweater (with zippers and pockets!). Shop all Reiss new arrivals here. This coat is so perfect and adore that skirt. I don’t think we’ll ever grow tired of seeing photos with those stunning Euro backgrounds! I’m obsessed with that skirt. What a great piece from the Reiss team! What a beautiful skirt!! and that setting is stunning. You matched this skirt and top perfectly! stunning photos, girl! I love that skirt…and coat. Totally not tired of your trip pictures as they are amazing! Love the skirt detail and this color palette. 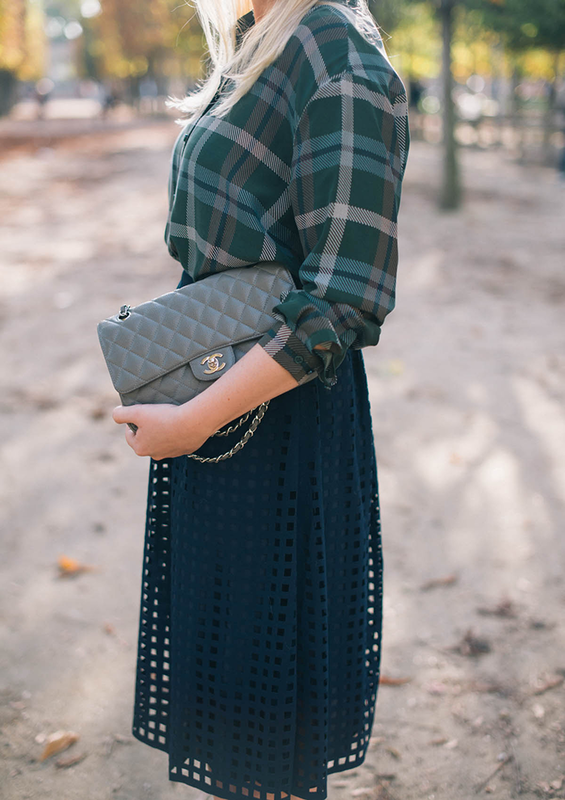 I love the plaid paired with the texture of the skirt, fabulous!!! Love the view! so pretty, love green and navy! Adore these photos – the backdrop can’t get much better! And that skirt is everything! Beautiful. Love the coat and shoes. Love this Parisian look Merritt!! That laser cut midi is a true beauty!!! Can’t wait to see how else you style it! Beautiful! That skirt is gorgeous. Love everything about this! Such a perfect combo of classic and modern pieces. Never hurts to have the Eiffel Tower as a backdrop either! Great skirt…love the way you paired it too. This skirt is such a unique and interesting piece! I love it and I love these photos! Gorgeous as always, Merritt! I love the laser cut detail and color of this skirt! 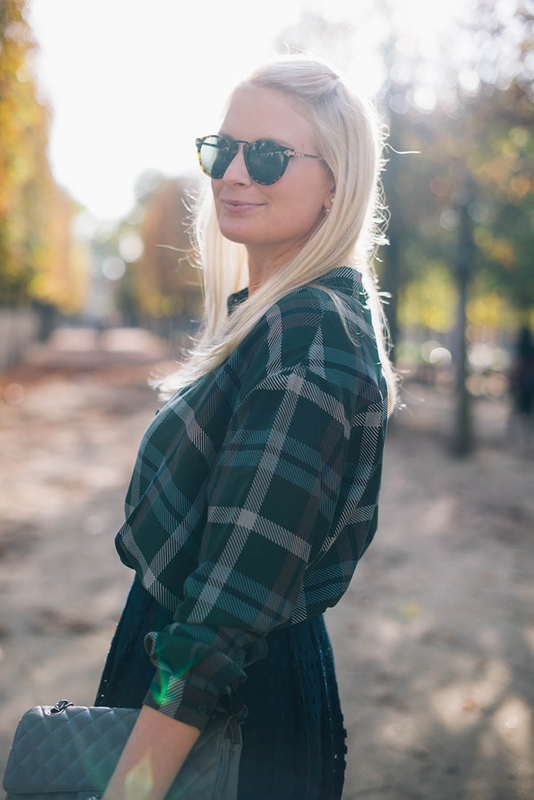 The green plaid shirt is such a great top! You look so cute! Love the color, patter, and texture in this outfit! Merritt, you look absolutely stunning! What an effortless look – love that top! I am SO jealous of that backdrop ;-) And that outfit is simply adorable. You’ve a gorgeous sense of style – love it! I adore the Reiss brand and that’s amazing you got to visit the headquarters! Your skirt is beautiful.